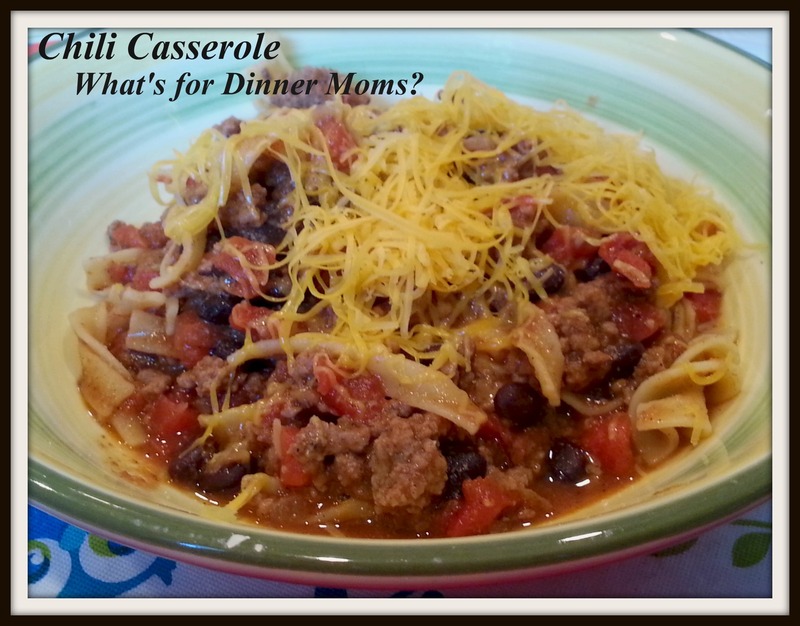 Chili Casserole – Remembering how Grandma and Mom Cooked – What's for Dinner Moms? Do you remember being little and sitting in the kitchen watching your Mom or Grandma cook? I remember my mother standing at the stove stirring, adding spices and stirring some more. My mother made two to four separate dinners every night because we would all rarely want to eat the same meal. What I don’t remember are lots of recipes. She cooked by intuition and memory. She had a small box with maybe 30-40 recipes in it. The recipes were mostly for cakes and breads that friends had made and she wanted to try. We had one cookbook, the red covered Betty Crocker cookbook. I still have that same cookbook in my kitchen. I like recipes for ideas. But, in the end I cook mostly by feel or combining 2-3 recipe ideas into one. I mix in what my family likes and leave out what I don’t like. I have made these recipes according to what we like not the masses. My family likes flavor, spice and tons of garlic. I get comments and messages about how people have changed things up to made the recipes better for their family. Good! That is what I want you to do. Don’t follow a recipe blindly. Taste and add more spices such as basil, garlic or pepper to the recipe. Don’t like peas leave them out or try substituting something else in. You may be pleasantly surprised. Want to try something more exotic? Try changing the spices and ingredients to make it more Moroccan or Mediterranean. I once started with a recipe for an Irish Cabbage Skillet that ended up being the most amazing German Skillet Dinner we have had in ages. So, to this end I have included all the spices I used in the recipe but try cooking like your mother or grandmother. Taste, add more. Trade black bean for kidney beans or add corn. Make this recipe your own and let me know what you did and how it came out. I am always looking for new ideas! This was a simple yet tasty dish. I added LOTS of garlic, chili powder, cayenne and onion powder with a dash of hot sauce to give it a kick. My son added MORE garlic and a bit of sour cream on top to make it creamier. We had enough for 2 bowls for everyone and a lunch serving for my son the next day. I served this dish with a green side salad and a crusty loaf of Italian Garlic Bread for sopping up the juice in the bottom of the bowls. For my mostly gluten-free son I served his with gluten-free pasta and made his garlic bread with gluten-free bread. Brown ground beef in a large skillet over medium heat. As the meat begins to brown add the diced onions and peppers to the pan. Stir well. Once the meat has browned and been broken into small pieces drain off any excess fat with a spoon. Add black beans and tomatoes to the pan and stir well. Begin adding spices. Start slowly and taste after letting the spices sit for a minute or two because the flavors will slightly intensify. Once you have it to how you like it simmer over medium heat stirring often for about 15-20 minutes until it thickens slightly. Taste again and adjust spices if needed. Stir in hot noodles and let the mixture warm together for about 5 minutes. Serve hot with cheddar cheese, sour cream and scallions on top if desired. Next Post Brown Butter Pecan Pancakes – The End of School is Near!